Cherokee has been with us almost since the beginning. 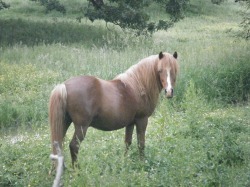 She is a beautiful pinto mare. She is in her 20's! Hard to tell...isn't it? 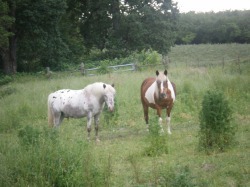 Buster, my sweet polka dotted pony is a POA which is a Pony of America. He is very strong and willing. He has been with us for many years as well. These two are almost always together. 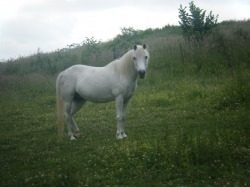 Squeekers is a great pony! He has been with us for at least 8 years now. Boy does time fly. He has been such a great addition to our group. With his long flaxen mane and big brown eyes he is always a favorite! What can I say about Bim....Bimini has been with us since the beginning. She is a happy pony who enjoys her job. She is playful and expressive and oh so beautiful. Maybe you can guess why her nickname is "Princess Bim"?